Ribena's Colouring Café in Covent Garden brought people together to colour-in a giant Ribena illustration. 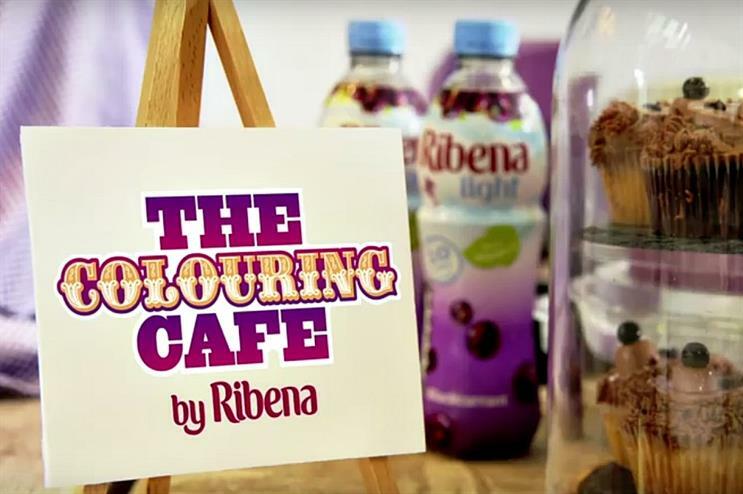 Ribena opened a pop-up Colouring Café for one day in Covent Garden last month, which was attended by influencers such as vlogger Giovanna Fletcher and creative girl gang, the Confetti Crowd. The drinks brand has now launched a four-week digital-led campaign using a creative film from the Colouring Café, which will be hosted on the brand’s website, alongside pictures of the day. The film’s reach will be amplified through Facebook, Instagram, YouTube, VoD and digital video. Ribena will also launch an online colouring app that allows users to colour in a piece of the Colouring Cafe illustration from their device, which can then be shared on social media. This digital campaign is the third phase of a national marketing campaign, which launched in 2015. In January, the campaign was bolstered by a £6m investment to to champion Ribena Light amongst its target audience. In April, the brand launched a national outdoor campaign, which included TV advertising, sampling, shopper activation and social media activity. Phase two of the ‘You Can’t Get Any More Ribenary’ campaign was the Colouring Café, which aimed to increase awareness of the Ribena Light range and drive relevance amongst its target audience of pre-family 16-34s. Outdoor advertising has supported the brand since 4 July, as well as sampling activity from 11 July. Ribena senior brand manager, Emmeline Purcell, said: "Our £6m marketing investment has been designed to appeal to young adults who want to make healthier choices without compromising on taste, and we’ve seen tangible results both in increased product sales and brand performance. "For this phase of the campaign, we’ve focussed on creating more meaningful interactions with our 16-34 audience, to make Ribena more relevant to them. Adult colouring in has become really popular over the last year and something that resonates well with our audience." In comparison to last year, the Ribena Light range has experienced accelerated growth of 22 per cent in retail sales.